We heard whispers of this situation back in February, but this is the first evidence of Baker's possibly closing. It would be a crime for this gem to fade away. Any ideas on how to help? Ahh, maybe visiting the place and having a dinner and a few drinks may help. This is pretty much the key to help any business stay afloat. "Business is off 35% to 40% in the last nine months..."
It sounds like this place is beyond help. Even the owner seems to see the writing on the wall as his major goal is to keep it open until May for the 75th anniversary. I absolutely love their smothered porkchops and cobblers. One of the all-time great Detroit date places plus a great cross-section of the best the city has to offer. I'm kind of surprised they are teetering so close to shutting down, especially if they own the property out-right. Yes the water bill is high, but are they on such shakey ground that a 30-40 percent business drop will doom them? Hard to understand if they own the building, which can be killer for many restaurants/bars if they didn't. I know I'll be going back ASAP for dinner, jazz and an amaretto sour! I'm guilty of not going much the last year or so. Think I'll plan on stopping by more often. I took the girl that is now my wife there on a date. That's how well it works! Everything is dying. It's all over. Knew I had a picture around here somewhere. 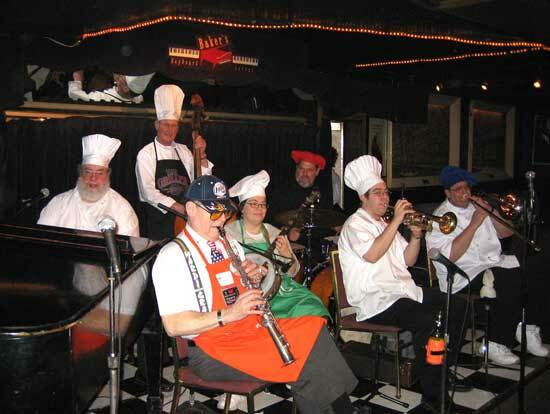 "The Chefs of Dixieland", last year. With RAGTIME RICK GRAFING on the piana! If you like Dixieland jazz, check out Ragtime Rick at his new restaurant, Ragtime Rick's Second Edition in Maumee, Ohio. Send an e-mail to ragtimerick@hotmail.com and get on the list. Great traditional "jass" just south of the border, with regular appearances by those old stalwarts of dixie, The Cakewalkin' Jass Band. I used to love sitting in those booths on a date! I know, I went on a few dates there as well, My cousin James Carter plays their whenever he comes to town! How about a benefit concert? I have great respect for that place and, like Kathleen, have been hearing the rumors for a month or so now. I have wonderful memmories of seeing so many great jazz artists there back in the 70's like Yusef Lateef, Horice Silver & Elvin Jones. I was there twice last month. The bar tender was very nice but the door man was very rude. You want biz, try being civil. Go see Perry Hughes on a Wednesday night. He is GREAT. What's the pricing policy for Baker's? How's the security? Is your car safe there? SARCASM ALERT: I sure am glad they laid that median in the road. That's probably helped them get a lot of business in these tough times. There is a guarded lot so yes, your vehicle will be safe. No cover on Weds to see Perry but they end around 11 pm, which might be good for many people. I think its $10 on a weekend night. My pal Noah Jackson runs the Sunday jam session from 6 to 10 pm and its free as well (I think). I had such a horrible experience with an out-of-town friend there in 2002 until I haven't been back. I've talked about it here before, but I will reiterate it again to offer another perspective. Until then, I often went to Baker's with colleagues and friends... but up until then, they were always African American. When I took a white friend with me, it was, without exception, the worst experience I have ever had in an entertainment establishment in any city, in any country. We were asked to leave in the middle of a set because we "weren't purchasing enough alcohol". My friend was religious and didn't drink, and I was the designated driver, so I couldn't have more than one... we asked if we could just pay a table charge -- $10? $20? $50? We really wanted to stay -- we explained she was from out of town -- and we were told to "get out of here". ) The only explanation I can even think of is that the owner and staff thought we were an interracial lesbian couple or something, which is ridiculous. She was Italian American from Chicago, and a graduate student in MUSIC -- piano major. She and a bunch of my other friends from school came that summer to visit Detroit, and all she wanted was to go to Baker's which I raved about. At the time I had my hair cut very short, as many professional black women do... maybe the staff read that as "butch", which is sheer ignorance -- we're both straight as arrows. It was a terrible experience for her. We were harassed nastily at the door, and the owner kept messing with us. At the time, she was 23 and I was 25... he kept saying we were lying about our ID and it was fake. I tried to talk to Baker's about what happened, and how embarrassed I was, and how it gave a negative impression of a famed establishment to an out-of-town guest. When that didn't work, I wrote to Kim Heron at the Metro Times. When that didn't work, I just went on with my life but told myself I'd never, ever go back. They also lost business from my school and sorority when I was in charge of anniversary and special occasion venues, because I would not consider them. Say what you like, but I am a native daughter of this city who's worked all my life to be a good person, to mentor the city's students, and to confront stereotypes. Everyone who knows me knows that I am NOT a drama queen. Quite the opposite. I always had a great time at Baker's before that night, but after the way we were treated, and the lack of caring about the impression an out-of-town guest had about the institution and by extension, the city... all I can say is "too bad". The problem with Detroiters is that we're so used to being treated like sh** until we expect it and accept it... and then wonder why we lose businesses. Really, now's the best time to share your one negative experience story about this place? I'm white, I've gone there all the time, never had a problem. There is a two-drink minimum per person, fairly standard club policies. Sounds like you weren't meeting that minimum and were asked to leave. Oh no!! I am a bit out of the loop what with having moved, so I hadn't heard rumors. I love, love, love Baker's. I hadn't been since last winter, so I made it my Saturday night activity that weekend. Even though the music wasn't to my taste in jazz (I like it straight-ahead, mostly, not so much for R&B-ish jazz) I love it just for being there. Really good food, too. Drinks are a little expensive. I only had one but they don't seem to have noticed, perhaps because my companions had two. Didn't know about the minimum. I reeeeally hope they make it. I'll go back on my next trip. Cover seems to be $5 all the time. It was $5 on the Saturday we went recently. Security (car and person) has always been good for me, but one data point doesn't mean anything. i'm sorry to read of an experience like yours. Surprised me, as I've not heard similar experiences. i'm a white guy and my companions when I go are various white, black and south asian, but Baker's always struck me particularly as a place that everyone went to regardless of where they were from or what they looked like or whether they were wealthy or not. I'd give them another chance, but I can understand that your experience would predispose you not to. I love the place. I have spent many Birthday's there, but I have to say that Cliff Bell's schedule has been killing Baker's. I will shed a tears if the place closes. Johnlodge: "I'm white, I've gone there all the time, never had a problem. There is a two-drink minimum per person, fairly standard club policies. Sounds like you weren't meeting that minimum and were asked to leave." We were well aware of that, and offered to spend FAR more money than the two drink minimum would have allowed for, as a $10, $20, even $50 EXTRA tip on top of a bill that was already well over the cost of two drinks. The couple next to us thought it was odd too, as we had already racked up a higher bill than they had with food, my cocktail and my friend's drink. Should I have had that second drink myself and then driven afterward? Should my out-of-town friend not have gone since she doesn't drink? I guess only drinkers are welcome in premier Detroit establishments... but I've gone out with too many nondrinking friends (even to Baker's before then!) to believe that. So it's not as if we were freeloading, and no other nightclub or "two drink minumum establishment" that I've been to has turned down an extra tip on top of the bill to make up for not drinking enough alcohol. If that were the case, people who can't drink for health reasons would never go to places like Baker's... and I know that's not the case. Oh well. You're free to critique my choice to share the story, as I am equally free to share. I offer it mainly as a counterpoint. People don't just stop going to places for no reason at all, and I am sharing my reasons. I'm sorry if my experience happened to rain on your parade, but it is what it is. Otter wrote: "i'm sorry to read of an experience like yours. Surprised me, as I've not heard similar experiences. i'm a white guy and my companions when I go are various white, black and south asian, but Baker's always struck me particularly as a place that everyone went to regardless of where they were from or what they looked like or whether they were wealthy or not. I'd give them another chance, but I can understand that your experience would predispose you not to." THAT was exactly why I was so shocked, angry and hurt. What had been a wonderful place to celebrate birthdays, retirements, and just good music, good food and good drink with good friends... a place I'd been talking up to my out-of-town friends for YEARS... became a source of huge embarrassment. And to add insult to injury, no one who worked there gave a sh**. There wasn't any attempt at even basic human decency. It was almost as if I'd walked into a time warp, and it was Baker's, but in an alternate universe. Wish it hadn't happened. But it did. They did what they had to do (kicked us out), and I have done what I needed to do (refused to patronize them ever again, and told everyone what happened to me whenever the subject comes up). That's all. Anyways, see the rest of you at Baker's. Sounds like they may have been afraid that you were underage. And that your non-drinking behavior made them even more suspicious for some reason. I hope Baker's can be saved. The place has been at the brink before and always managed to come back, but I have to imagine that these are amazingly tough times to be in the entertainment business. Cliff Bell's seems to be doing quite well (saw you there RJ - nice show! ), but there just can't be much of a customer base to go around right now. Perhaps this is a generational issue - Baker's and Cliff Bell's have different clientele. I see young(er) folks at Baker's but the audience is primarily older. Bell's may pay better. It is larger and has a 'moderne' feel whereas Baker's is a small Lounge. It's tough to make a buck with max seating around 100 - it worked well during the 40s - 80s but as attrition thins the jazz ranks performance fees climb. OK, Eastsideal, you got me. You got me. I'm sorry, folks, for raining on your parade and being such a negative Netty. So yeah. I hope Baker's can be saved. For all of your sakes... and for the city we love. English, for what it's worth, my wife and I are in Baker's most every week and we'd be happy to meet you there - we go Weds/Thurs, usually. We are going tomorrow night, Ben Pruitt's orchestra is playing and they are excellent, easily the equal of any band around town. His arrangements are just great. I also think that Baker's location - once an asset - is now something of a liability. While, with developments over the last several years, downtown places now have an advantage.